If you have never seen The Wizard of Oz than obviously you have been living in a cave somewhere in the Himalayas and this classic 1939 musical has received a magical blu-ray makeover. The original movie began in Black and White with a cyclone taking Dorothy to the magical world of Oz and once she arrived, the magic of Technicolor kicked and from there the wondrous story of the film began. Watching The Wizard of Oz again on blu-ray is like a master painter has used a magic paint brush on the movie as all the colours are bright and vibrant with some very impressive picture quality for a movie that is over 70-years old. In relation to the story, it revolves around Dorothy who, including her dog Toto are whisked away to the land of Oz where she meets a variety of colourful and scary characters such as the Munchkins or the nefarious Wicked Witch. Thankfully she has a group of friends that include the Scarecrow, Tin Man and the cowardly Lion. 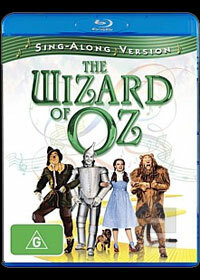 This Hollywood classic was directed by Victor Flemming who successfully managed to capture the magic of this story and translate it into a motion picture which stars the extremely talented Judy Garland as Dorothy with her interpretation of Over the Rainbow still one of the greatest songs in Hollywood history. Apart from the talented Garland who was only 16 when this movie was made, it stars some other stellar performances by Ray Bolger as the Scarecrow, Jack Haley as the Tin Man and finally Bert Lahr as the Cowardly Lion who really get into their role and help draw the viewer into this story. Of course, the Wicked Witch (Margaret Hamilton) is still one of the scariest characters to have graced the silver screen and as she attempts to thwart Dorothy from saving Oz and returning home with the words "I'm melting" still ringing strong today as they did in 1939. Perfectly cast indeed as is Billie Burke as the magical Glinda. Needless to say, the story is a timeless classic, however where this version of the movie differs from the others is through the Sing-a-long option that allows viewers to join in. Brilliant! The video quality on Blu-ray is very impressive and although presented in 1080p for such an old movie, the images are sharp and the colours are vibrant. Even though much of the grain remains from the original movie, comparing this to the original movie and the Blu-ray version is an extreme contrast. In terms of special effects, even though CGI would not be invented for several decades to come, the special effects are quite impressive, especially the scary creatures of the witch and the various sets and costumes. Adding to the high video quality is the sound which supports true Dolby Digital 5.1 and only helps captivate the viewer even more. There are even some great moments in the movie that roared through our surround sound system and is considered one of those "wow" moments. Of course to compliment the 70th anniversary of this movie, the Sing-along version features a healthy dose of special features from commentary by relatives and those who worked on the film which gives us a great insight into the creation of this film. With deleted scenes, featurettes and just about everything you ever wanted to know about the movie, this is definitely a first classic experience. In conclusion, the Wizard of Oz is definitely one of the top 10 greatest movies ever made and those who have seen the movie before will once again be swept off their feet when they see the Blu-ray version, especially with the option of a Sing-along. Best of all, even if you have never seen the movie before, this is one film that will never date and features a timeless story that can be watched by everyone.